Florian Meier is an Associate with Knippers Helbig – Advanced Engineering and is currently co-leading the New York Office. Florian is a structural engineer and was trained at the Technical University of Munich. with a focus on architectural geometry, computational formfinding methods and structural optimization at the renowned chair of structural analysis, Prof. Bletzinger, where he was a research assistant. During his studies, Florian received a scholarship at the Oskar von Miller Forum, Munich, which is an interdisciplinary and internationally oriented excellence initiative for students in the field of construction. Florian has experience in a variety of materials and innovative fabrication technologies. Among other projects, his portfolio includes the granite stone vault of the Sean Collier Memorial in Cambridge (Höweler + Yoon Architecture), a canopy robotically manufactured using carbon-fiber reinforced polymers (Achim Menges), and the 150 ft. spanning steel and glass dome of the Academy Museum of Motion Pictures in Los Angeles (Renzo Piano Building Workshop). Florian is a member of the International Association for Shell and Spatial Structures (IASS), where he recently presented. His work has been published in magazines and conference papers, such as DETAIL structure, Bautechnik, Deutsche Bauzeitung (DBZ), IASS, Advances in Architectural Geometry (AAG). At Cooper Union, Florian is currently co-teaching ARCH132 Structures II. ©Renzo Piano Building Workshop / ©A.M.P.A.S. AMMP is the world's first feature space museum devoted to the feature film to celebrate the art and technology of the film. 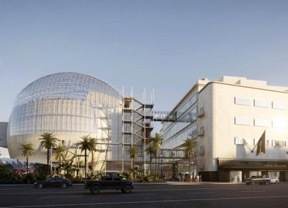 Spread over six floors, covering an area of ​​290,000 square feet (26,942 square meters), the $300 million project includes a 1,000-seat cinema, several showrooms, and storage for the collection. Knippers Helbig supports the design team as a facade and structural engineering of the spherical glazing of the roof terrace. The dome consists of a latticed shell stiffened with ropes, in the secondary level there are flat, shingled overlapping glass plates. The airy and weightless appearance lets the structure of the dome fade into the background. Knippers Helbig is also responsible for the design of three internal steel and glass stairs. The Collier Memorial, designed by Höweler + Yoon Architecture, was built on the campus of the Massachusetts Institute of Technology (MIT) in Cambridge, USA. The stone sculpture creates a lasting memory of officer Sean Collier and his service to MIT. The structure, consisting of five radial walls that meet in the center, is inspired by the gesture of an open hand. The monument consists of 32 massive blocks of granite from native quarries. The stones are manufactured with high accuracy to create the complex geometry with minimal tolerances. The vertical self-weight loads can be removed by means of arch support and thus by pressure, although the shape is relatively flat in the middle region. At the foundation, a strip foundation prevents horizontal shifting of the granite blocks and transfers the vertical loads to the foundation piles. Knippers Helbig assisted Höweler + Yoon Architecture with the structural design of the sculpture, developed specific connection details, taking into account the architects' design requirements, and advised on the design of the load-bearing capacity test program and test evaluation. The "Crisscross Signal Spire" - an interactive light art work designed by Höweler + Yoon Architecture - acts as a lighthouse-like sculpture at historic Dudley Square in Boston. The integrated LED lighting system in the interwoven tubes visualizes the communication flow of certain social media in real time. The stainless steel tubes have a diameter of only 100 mm and form a self-supporting composition with a height of more than 11 m. The braided arrangement of the pipes ensures sufficient global rigidity and is optimally adapted to the complex requirements of wind dynamics. Even the perforation density along the pipes is based on static requirements.